Lau Kar-leung‘s influential directorial debut is often credited for being a precursor to both the slapstick kung fu comedies of Ng See-yuen at Seasonal Films (Snake in the Eagle’s Shadow, Drunken Master), and the supernatural shenanigans of Sammo Hung. There are certainly signs of Jackie Chan in Wong Yu’s comedic central performance, playing a juvenile, opportunistic orphaned street rat whose sifu is a cipher for the alcoholic Beggar So. And Sammo clearly lifted the haunted mansions, Taoist priests and black magic routines for his extraordinary Encounters of the Spooky Kind. 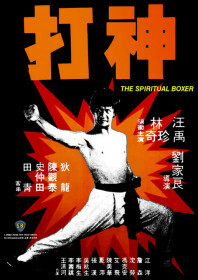 The film centres around Lau Kar-leung’s general distrust of the so-called ‘spiritual arts’ and the unwitting, superstitious victims of supposedly supernatural scams. It starts with a neat demonstration of spiritual boxing with cameos from Shaw superstars Ti Lung and Chen Kuan-tai, who are shown to deflect blades and bullets after being embalmed in burning scripture. This title sequence has nothing to do with the rest of the film, which follows the scheming exploits of Wong Yu and androgynous orphan girl Lin Chen-chi, who incur the wrath of an evil kung fu school who have been terrorising the poor village folk. Wong Yu’s character is a charlatan with a stash of fake knives who pretends to summon the almighty skills of the monkey god and General Kwan before each confrontation. But Lau stops short of painting Wong’s character as simply an enfant terrible: he is shown to have genuine compassion in his dealings with the lower classes, and when his drunk sifu does finally appear, he possesses a genuine kung fu ability. “If you believe, then it’s real,” he says. This was a bold and unexpected debut from Lau, and even with his first film, he is displaying the kind of intellect, invention and vision which would make him one of the best kung fu filmmakers of all time.